Norman Henry Denham Henty, an energetic, down to earth Tasmanian businessman, belonged to a well-known pioneering family that had settled in Victoria, Tasmania and Western Australia. His parents were Thomas Norman Henty, a storekeeper, and Sarah Lily Nina, née Wilson, the daughter of a surgeon. Thomas managed a small retail grocery business, A. Brown & Co., in the Tasmanian town of Longford, where, on 13 October 1903, Norman Henry Denham was born. Denham, as he was known, was second of four surviving children. Henty commenced his political career in local government, as an alderman for Launceston City Council (1943–51), serving as mayor from 1948 to 1949. Considered medically unfit for military service during World War II, he became a member of the Volunteer Air Observers’ Corps and by 1943 was its commandant. A staunch believer in free enterprise, he was closely involved in the foundation of the Liberal Party in Tasmania in 1945, serving as one of the party’s five vice-presidents. With his brother Jim, who would become a member of the Tasmanian House of Assembly (1968–72), Henty helped to establish Liberal Party branches in northern Tasmania, and was on the party’s first state finance committee in August 1945, playing a vital role in formulating the party’s funding base. This was the background to his preselection for the Senate in 1949 and his subsequent electoral success, along with fellow Liberals, J. A. Guy, R. H. Wordsworth and R. C. Wright. Henty took up his seat on 1 July 1950, in a Senate in which the ALP had a clear majority, despite the Liberal Party’s victory in the House of Representatives. The simultaneous dissolution of both houses on 19 March 1951 required him to face the polls again on 28 April. Re-elected, Henty’s new six-year term was deemed to have commenced on 1 July 1950, a constitutional phenomenon that intrigued him. Retaining his seat comfortably in 1955 and again in 1961, he would become known in the Senate as a man of conviction, one who, as the Country Party’s Senator McKellar described him, favoured a ‘box-on’ with words, not fists. Henty was considered a purposeful and effective advocate for Tasmanian interests, asking questions on post offices in Launceston, air freight services to Tasmania and petrol shortages on King Island. In 1954 he congratulated the Government on improved grants for Tasmanian roads, for which Tasmanian senators had been lobbying. In 1960 he supported the development of the Bell Bay Aluminium Works, as well as the sale of Commonwealth assets in the company. On the question of shipping, he did not favour a government-owned shipping line, as ‘nationalization and communism run side by side’, and supported the Australian Coastal Shipping Commission Bill 1956 which repealed the restriction on private enterprise entering the market while at the same time allowing the Government to continue its own shipping line. He had a strong feeling for the Senate as a protector of states’ rights, saying in 1956: ‘As a small States man, I shall never be a party to permitting Sydney and Melbourne to dominate this country’. [Henty’s] vast commercial experience enabled him to give advice on what the market place was thinking and what ought to be done … He was amazingly well informed on the retail trade and whenever we were dealing with the necessity to give a stimulus to the economy or to impose restrictions you could bet your life that he would give data which would make you better informed than if you relied on official sources. Sales tax was a pertinent example. In 1952 Henty stated bluntly, ‘I do not like sales taxes’, though he exercised some flexibility in his views, as with the 1950 Sales Tax (Exemptions and Classifications) Bill, when he supported a sales tax on lipstick. Overall, he supported exemptions and called for an examination of the administration of the legislation and for the simplification of sales tax schedules. In October 1956 Henty, renowned for his ability in debate as well as his business acumen, became a junior minister, holding the portfolio of Customs and Excise, and representing in the Senate the ministers for social services, immigration, health and the army. He immediately sought to eliminate inefficiencies in his portfolio, for example by introducing changes to administrative controls in the Beer Excise Bill 1957 and to the 1960 Customs Bill (No. 2), which simplified the movement of petroleum products. As he said: ‘I had been customs and shipping clerk in my own firm at one time and I had been on the receiving end’. Dubbed ‘the senator who believes in simplicity’, he wanted, as one newspaper put it, to do away with the Commonwealth Government’s ‘paper war against the citizen’. In 1957 Henty introduced the first of a number of changes to the Customs Act. He provided the Leader of the Opposition in the Senate, Senator McKenna, with detailed notes for the committee stage of the legislation, prompting a courteous response from McKenna and gaining the Opposition’s support, but not that of Senator Wright. The irony for Henty, who desired ‘to serve faithfully all members of the Senate irrespective of which political party they support’, was that it was maverick Liberals, such as Wright, often reflecting genuine political differences within the Liberal Party, who would hold up legislation. One such instance occurred in 1962 in relation to the Tariff Board Bill, when Wright felt that governments should not have undue power to interfere with industry, and that if such powers were conferred these should be in accordance with the law laid down by Parliament. Henty had little choice but to be conciliatory, as he was again when Liberal senator Wood, chairman of the Standing Committee on Regulations and Ordinances, sought to disallow a Customs (Prohibited Imports) regulation that would have enabled the minister to hold absolute discretion on the import of ‘obscene’ publications into Australia. Wood withdrew the motion after Henty, with more of his usual politeness, had the regulations redrafted. In 1963 Henty became a member of Cabinet, reducing his ministerial representation in the Senate to the portfolios of immigration, supply and the army. For a time in 1964, he represented supply, immigration, the army and the navy. All this gave him parliamentary experience that doubtless contributed to his becoming Deputy Leader of the Government in the Senate from June 1964 until January 1966. During this period, he was also Minister for Civil Aviation and served as minister representing the Treasurer, trade and industry, the army and the navy in the Senate. In the civil aviation portfolio he sought to increase ministerial discretion through an amendment to the Customs (Prohibited Imports) Regulations in 1965. McKenna, in moving a motion for disallowance to prevent the minister having discretion over the import of aircraft, air frames and aircraft engines, pointed out that the regulation was aimed at negating IPEC-Air’s proposed appeal to the Privy Council regarding their application to import aircraft for air freight services. The motion was carried, with two Liberals, Clive Hannaford and Wright, and the Democratic Labor Party’s McManus and Gair, voting with the Opposition. Henty, torn between his wish to modernise the air freight system, and the political imperative of the preservation of the two-airline policy, would later recall this episode as his greatest regret as minister. In January 1966 Henty became Leader of the Government in the Senate, as well as Minister for Supply in the Holt Ministry. As he suggested, an ‘easy’ portfolio made the Senate leadership somewhat lighter, though from March he represented in the Senate the Treasurer and the ministers for trade and industry and national development. Although he had always believed in the importance of the Senate, he considered that ministers should not sit in that house, as senators should be free to debate and to vote without being fettered by government policy. Nonetheless, as Government leader he felt compelled to exercise a greater degree of authority, as in March 1967, when Senator Wright was invited by Senator Murphy, the Leader of the Opposition in the Senate, to accept membership of the proposed and politically controversial Select Committee on Repatriation. Henty informed Wright that if he accepted Murphy’s invitation his position as a ‘Member of the Government Party’ would be reconsidered, which Wright described as an act ‘without precedent in the history of this Parliament’. In the event, Murphy’s motion to establish the committee was lost. Earlier, Henty’s suggestion to Prime Minister Menzies for select committees on water and air pollution had met with an unenthusiastic response. Henty had backed off quickly, though he later gained the necessary support from Prime Minister Holt, and managed to have the two committees established towards the end of his time in the Senate. He commented that he ‘was the first Minister to propose the appointment of a Senate select committee after having obtained Government support for it’. Opposition senators described him as ‘a cunning tactician’, though having a friendly personality. In March 1966 Henty announced that he would not be available for preselection and in October 1967 stepped down as Leader of the Government in the Senate. He was replaced by John Gorton, whose leadership skills he doubted. Gorton, in his new role, won praise for tabling documents demanded by the Senate as a consequence of the notorious VIP affair, where there were claims of persistent misuse of the RAAF’s VIP fleet. Henty had felt unable to table the documents in the face of a Cabinet decision not to do so, and this was a factor in his decision to resign as Leader of the Government. Henty retired as Minister for Supply in February 1968, leaving the Senate on 13 June, a few days after his appointment as KBE. As he had intended, he remained active in Liberal Party politics in Tasmania and at the federal level, accepting an invitation to join the federal campaign committee. He made significant contributions of time and money (including his parliamentary pension) to a number of local organisations. Henty was a director of the Launceston-based Equitable Building Society (1969–77) and of A. G. Webster and Woolgrowers Ltd (1969–75). 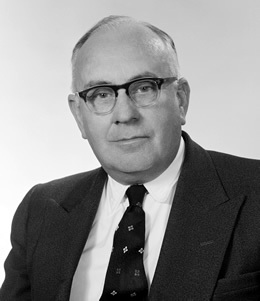 He was a member and chairman of the Launceston General Hospital Board (1970–72) and a commissioner of the Overseas Telecommunications Commission (Australia) from 1968 to 1974. In 1975 he was on the general committee of the Launceston Bank for Savings. In 1970 Henty had been made an honorary freeman of the City of Launceston, where he continued to live until his death on 9 May 1978. His wife and three of their four children survived him. In the Senate, Henty was remembered kindly, even by his old antagonist, Senator Wright, who described the Launceston Airport terminal, modernised during Henty’s ministry, as a ‘worthy monument’ to Sir Denham, and ‘the loveliest airport in Australia’. Henty once berated an interjector, ‘I am not playing at a political level. I want to say something that is of use to the nation’. He believed that Australian business, in its approach to trade and to customer satisfaction, could learn ‘some lessons’ from Asia. In December 1959 he introduced regulations making the export of fauna for commercial purposes illegal. In 1957 he helped ensure that J. D. Salinger’s Catcher in the Rye was released for distribution in Australia, and subsequently became responsible for the liberalisation of the censorship of books and films. According to Tasmanian Labor MHR, Gil Duthie, Henty made censorship ‘more realistic, more humane and less secretive’. Henty’s contribution to Launceston, Tasmania and Australia is honoured in a waterscape memorial close to Henty House in the Launceston Civic Plaza. R. J. K. Chapman, ‘Henty, Sir Norman Henry Denham’, ADB, vol. 14; Sir Norman Henry Denham Henty, Transcript of oral history interview with Suzanne Lunney, 1974, TRC 309, NLA, pp. 1:1/2–13, 1:2/7–8; R. A. Ferrall, Notable Tasmanians, Foot & Playsted, Launceston, Tas., 1980, pp. 87–91. Henty, Transcript, pp. 1:1/3–11; The editor is indebted to Ross Smith, Queen Victoria Museum and Art Gallery, Launceston; Examiner (Launc. ), 10 Dec. 1943, p. 4; Rosemary Lucadou-Wells, Fifty Year History of the Liberal Party (Tasmanian Division), Liberal Party (Tasmanian division), 1994, pp. 6, 21, 24, 36. CPD, 13 June 1968, pp. 1805, 1812. CPD, 10 May 1978, p. 1540, 30 Sept. 1953, pp. 317–18, 9 Nov. 1954, p. 1248, 9 Sept. 1954, p. 246, 27 Oct. 1954, pp. 1030–1, 21 Sept. 1960, pp. 607–13, 7 June 1956, pp. 1339–40, 28 Feb. 1956, p. 140. CPD, 10 May 1978 (R), pp. 2115–16, 16 Sept. 1952, pp. 1414–15, 30 Nov. 1950, pp. 3356–8, 22 Oct. 1953, pp. 865–7, 2 May 1956, pp. 476–80. SMH, 19 Oct. 1956, p. 1; Sun-Herald (Syd. ), 21 Oct. 1956, p. 22; CPD, 21 Mar. 1957, pp. 65–6, 25 Aug. 1960, p. 222; Henty, Transcript, p. 1:1/13; CPD, 1 May 1957, pp. 513–14, 2 May 1957, pp. 540–6, 18 Oct. 1956, p. 752, 10 Apr. 1962, pp. 863–6, 27 Nov. 1962, pp. 1498–9, 4 Dec. 1962, pp. 1700–1. CPD, 25 Aug. 1965, pp. 77, 120; Henty, Transcript, pp. 1:2/8–10. Henty, Transcript, p. 1:1/34; CPD, 28 Feb. 1956, p. 139; Correspondence between R. C. Wright and Henty, Mar.–Apr. 1967, Personal Papers of Prime Minister Holt, M2684, 130, NAA; Henty, Transcript, pp. 1:1/15–16; CPD, 2 Apr. 1968, pp. 489–501, 7 May 1968, pp. 813–16, 13 June 1968, pp. 1805, 1812. Mercury (Hob. ), 12 Mar. 1966, p. 1; Peter Howson, The Howson Diaries: The Life of Politics, ed. Don Aitkin, Viking Press, Ringwood, Vic., 1984, pp. 253–4, 339, 352–3, 357, 937; Advertiser (Adel. ), 24 Feb. 1968, p. 3; Letter, Henty to H. E. Holt, 1 Sept. 1967, Personal Papers of Prime Minister Holt, M2684, 130, NAA; CPD, 10 May 1978, pp. 1539–41. CPD, 12 Sept. 1956, pp. 249–51; SMH, 5 Dec. 1959, p. 10; Peter Coleman, Obscenity Blasphemy Sedition: Censorship in Australia, Jacaranda Press, Brisbane, 1963, pp. 31–2; SMH, 26 Oct. 1957, p. 4; Gil Duthie, I Had 50,000 Bosses: Memoirs of a Labor Backbencher 1946–1975, A & R, Sydney, 1984, p. 185; Examiner (Launc. ), 30 Mar. 1968, p. 3. This biography was first published in The Biographical Dictionary of the Australian Senate, vol. 3, 1962-1983, University of New South Wales Press Ltd, Sydney, 2010, pp. 124-128.